Every day, thousands of Muslims including you and I utilise the numerous musollahs around Singapore. However, only but a handful of people make it their responsibility to clean these sacred places of worship we use daily. 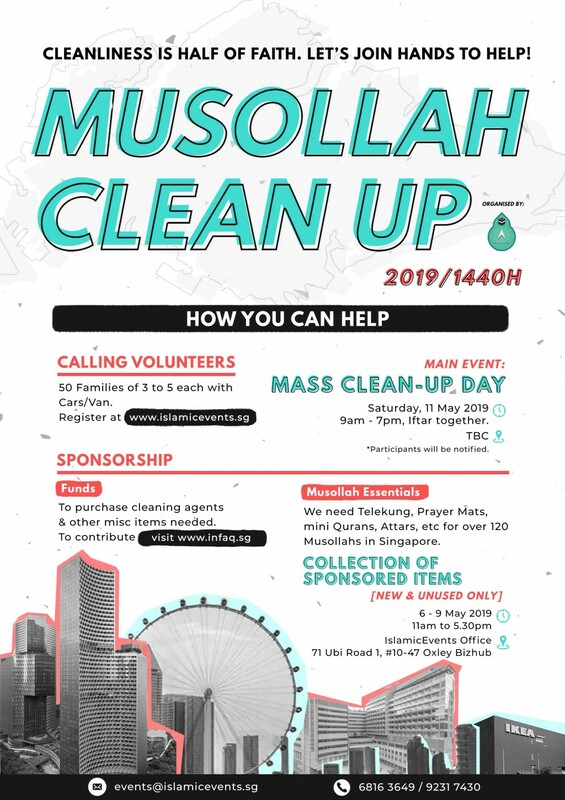 Following the success of the mass musollah cleanup in 2013, 2015 and 2017, we are again putting our efforts to clean more than 120 musollahs islandwide this year, insyaAllah. In order to make this large-scale effort a success, we would need your help in any way that you can lend a hand. If you can make it down, we're more than happy to have you on board. If you're not available on that day, consider contributing to our operating funds, or by donating *new and unused* items for musollahs like mini Qur'ans, telekungs and prayer mats! Every single contribution counts to make this collective effort a reality. This year we will be more family oriented as we would like to see parents bringing their children to come together to "Gotong Royong" in this project. Use this Ramadan to make efforts to spend time and be engage in activities like this with your family. *Please give new and unused items only. 5.30 PM - Volunteers to make way back to [ Location TBC ] to return dirty telekungs, sejadahs, etc. 7.10 PM - Maghrib & Iftar - Closing sessions. 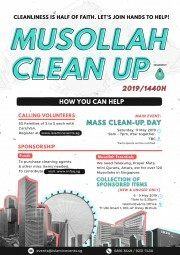 Jazakumullah khayr for your willingness to help clean our places of prayer in this Ramadhan! We look forward to work with you.